Cortisol is the main stress hormone in your body that helps control your mood, fear, and motivation. High cortisol levels can cause weight gain, mood swings, high blood pressure, digestive problems, and fatigue. Although the cause of high cortisol is often stress, elevated cortisol levels can be caused by adrenal gland problems or medication. Knowing how to lower cortisol levels depends much on the cause. For example, if stress is causing too much cortisol, then finding ways to deal with stress should reduce cortisol. Some cortisol supplements such as hosphatidylserine, ashwagandha and Omega-3 can help reduce high cortisol levels. Lifestyle choices such as enjoying a healthy diet or relaxation can also help to reduce cortisol levels. However, your doctor may recommend certain medications or other treatments depending on the cause of the high cortisol levels. In this article, you will learn about the symptoms of high cortisol levels. You will also find out how to lower cortisol naturally to help you enjoy a better quality of life. Your adrenal glands produce the hormone cortisol and adrenaline that is often connected with the “fight or flight” stress response. Your hypothalamus (a part of your brain), pituitary, and adrenal glands are involved in cortisol production. This is sometimes called the hypothalamic–pituitary-adrenal (HPA) axis and is known to regulate many of the body’s responses to stress. Usually, when the threat goes away, cortisol level decrease and return to normal. However, chronic stress, underlying health conditions, or sleep deficiencies can cause constant excess cortisol symptoms. Over an extended period of time, high cortisol levels can lead to a condition called Cushing’s syndrome. High cortisol symptoms can affect your body in a number of ways. Depending on the cause of increased cortisol, you may have one or a number of symptoms. Let’s look in more detail at the most common signs of high cortisol. Long-term stress can cause weight gain because it increases hormones in your body such as cortisol and ghrelin (the “hunger hormone”). This can lead to an increased appetite and cravings for sweet, calorie-dense foods, as well as foods high in carbs. One of the symptoms of excess cortisol levels is changes to your mood. A cortisol imbalance can also cause a loss of emotional control that can manifest itself as panic attacks. Having high cortisol levels means that you probably suffer from various digestive issues. One of the symptoms of Cushing’s syndrome is an increase in cortisol levels that causes hypertension. One of the symptoms of excess cortisol is skin that is fragile, doesn’t heal fast, and breaks out in acne. High cortisol levels can affect bone health and may lead to increased risk of fractures if cortisol levels continue to be high. What causes high cortisol levels? Let’s see how stress, pituitary gland dysfunction, and lifestyle choices can all cause cortisol levels to spike. One of the most common reasons for showing signs of excess cortisol is stress. It is important to reduce elevated cortisol levels to limit the side effects of high cortisol. What can you do if you show signs of too much cortisol? Finding strategies to cope with stress can help to bring down cortisol to normal levels and prevent its side effects. 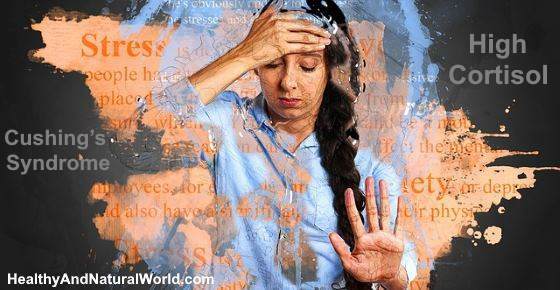 Find out more about how to deal with stress and anxiety and which supplements have stress-relieving effects. You may also find it helpful to know what to do to boost your mood as that can also help regulate cortisol levels. Foods that can increase cortisol are refined sugars, unhealthy carbs, and saturated fats. Healthy food choices such as increasing your intake of fruits and vegetables help balance your hormones better. One of the ways to prevent suffering from the symptoms of high cortisol is to get enough sleep. Excess cortisol levels are just one of the ways a lack of sleep affects your body. Find out what else happens to your health when you don’t get enough sleep. If you have trouble getting to sleep, find out which foods can help to get a better night’s sleep. Enjoying regular exercise can help to reduce your cortisol levels because it helps to cope with stress better. Walking is a great low impact exercise that can act as a cortisol reducer and manage your stress levels. One of the benefits of walking every day is that it helps to get rid of excess body fat. If your health is suffering from an overproduction of cortisol, then taking supplements along with positive lifestyle changes can help. The supplement phosphatidylserine has a positive effect on your mind and memory and can help reduce cortisol production. Ashwagandha is a good supplement to provide support during times of emotional or mental stress. Because of this, ashwagandha supplementation can help reduce cortisol levels. Learn more about the proven benefits and uses of ashwagandha. Taking omega-3 fish oil helps to lower inflammation and can help to negate the undesirable effects of high cortisol levels. Depending on the underlying cause of increased levels of cortisol, it may not be possible to decrease cortisol naturally. If you show signs of having excess cortisol, your doctor will run various tests to check for Cushing’s syndrome. I have had Cushing’s on 3 separate occasions. First time was on my pituitary gland, second time was on my adrenal gland and the third time it was on my pituitary gland again. As a result of this, I have had 2/3 of my pituitary gland removed, my adrenal gland removed (they had to break and remove a rib to take it out) and each time I got it I gained between 60-70 lbs. Blood pressure and cholesterol were extremely high. Now I have the opposite problem, where my cortisol is extremely low and I need to take steroids to keep it at an acceptable level. my cortisol is extremely low and I need to take steroids to keep it at an acceptable level. Did anyone ever feel cortisol burning your insides when high amounts were released? Pam. I agree. To me I use the analogy of a car battery overcharging somehow. I can feel the effect trying to manifest thru thinning skin, and can easily be scratched or abraided.Nasty enough to produce blistering lesions that can show up withen hours and either dissappear or take a long time to heal. But most definately feel it cursing through one’s system. I will sometimes get hot flashes, and skin feels dry and stings. Hi Dawn, long-term use of corticosteroids and chronic stress are two of the biggest contributors to high cortisol, but there are other medications that can cause it as well as other health conditions. I guess the best solution is to go through a proper medical assessment by your doctor to find out the cause of the elevated levels of cortisol. what are your cortisol management supplements? Since I nearly died from hyper-cortisol disorder from chronic stress, I can relate. First thing is cut all processed foods from your diet. Shift to half of your diet being plant based at least. exercise daily. If there is a person in your life using you as I had, cut them from your life. Especially if they have major health problems that tend to asperate their mental problems. Meditate……..and whatever and however you can, SLEEP. Test your cycling cortisol levels. Mine were at the saliva test highs in the morning. Had to take cortisol manager at night to knock it back to reasonable levels. REST………stop being a superwoman or man. Its nto worth it. No caffeine no alcohol………..both release high amounts of cortisol since one is a trigger to your adrenals to release cortisol (caffeine) and one is a poison which triggers your adrenals to release cortisol. I also went to a counselor to suppress my triggers psychologically due to my childhood traumas. Who knew that something at 5 yrs old trained one’s adrenals to be sensitive all your life. My cortisol levels were 3 times higher than should be when tested now I have to see a specialist, I have gained easily 50 pounds in its all in my mid section belly. I feel like I gain at least 1 pound everyday. I am a stressed person when I’m not stressing I find something to stress about. I do take Adderall 90 mg a day . sometime more could the Adderall be causing my high levels of cortisol? I’ve seen that Adderall has a wide range of side effects although I don’t know about cortisol. I would get a second opinion from another specialist as to whether you really need that type of medication or whether there is a better option for you.